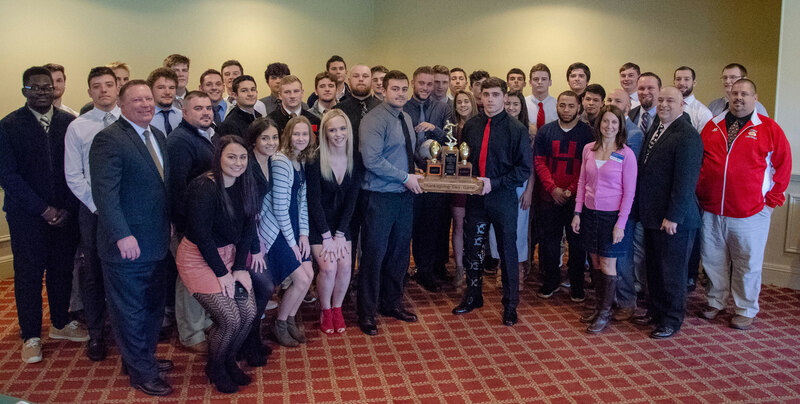 A Rotary Thanksgiving tradition was renewed on Tuesday, November 20 when the Derby-Shelton Rotary club hosted senior members of the Derby and Shelton High School football and cheerleading teams for the annual Thanksgiving football luncheon. The event, which is held two days prior to the game, has a long and interesting history with this year’s luncheon being the first one held at Brownson Country Club. Past President Ed Sheehy served as the emcee for the event. Ed is also an alumnus of Derby High School and played in the game himself when a student at Derby High School. He regaled the audience with stories of games going back more than 100 years. Besides the players, other dignitaries in attendance included the mayors, superintendents of schools, athletic directors and coaches. Derby High Coach George French and Shelton High Coach spoke of their seasons and introduced their players. Both coaches are also graduates of their respective schools and played in the game as well. As always, the highlight of the event was the remarks made by alumni of the two schools who talked about their experiences as players as well as what the game has meant to them for the rest of their lives. Mike Manzo was the speaker from Shelton and he highlighted what he learned from the motivational term “EARN IT” that was more than a slogan to him and his teammates at Shelton High School. Andrew Baklik spoke about what motivated him to be successful during his career and how his love for the Valley brought him back to the Valley after early career moves had seen him living elsewhere. Click on the videos below to listen to their remarks. 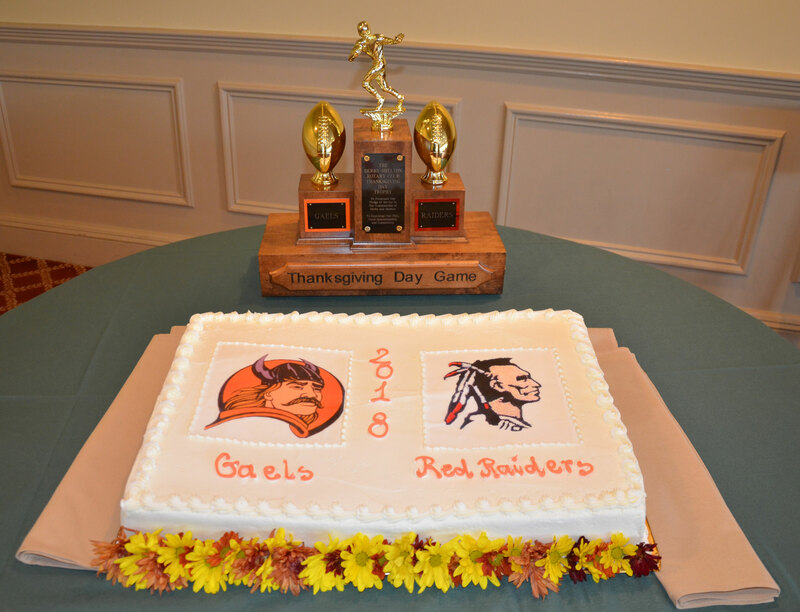 The game will be played on Thanksgiving at Finn Stadium in Shelton at 10:30 am. The winner will be presented with the Derby-Shelton Rotary trophy which goes to the winning team to hold until the next Thanksgiving game. Once a school accumulates 10 wins, it gets to retain the trophy permanently and a new one is put in play. Shelton has currently won the 8 games played since the trophy was put into play, though there have been many others down through the years. The current trophy was designed and built by Tony Branca, former head coach at Shelton High School. It is the second time he has done so, and the Gaels have permanent possession of the first one that he designed and built! For a complete history of all the games, click here. Another post-game highlight will be the presentation of the Silver Turkey Award to the outstanding player in the game. This award was originally presented by the Suburban News in 1967 and Valley Publishing has carried on the tradition. For a complete list of past winners, click here. 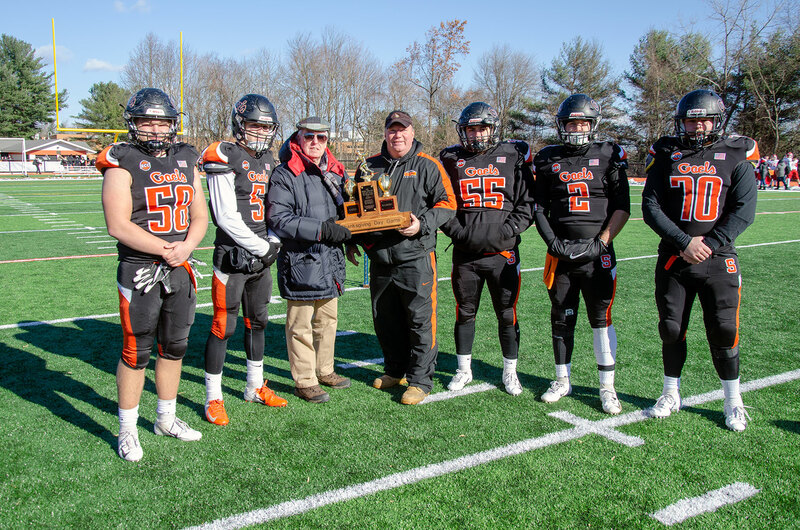 Pat President Jack Walsh presented the Derby-Shelton Rotary trophy to winning coach Jeff Roy and the Shelton captains following Shelton’s 62-6 win.